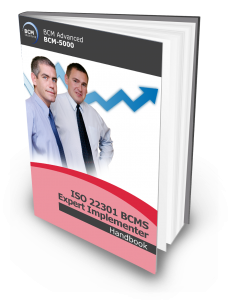 BCM executives who are in charge of their organisation’s BCM plans who are looking to upgrade their competency may like to sign up for this 4.5 days holistic ISO 22301 Business Continuity Management System. Experienced BCM executives who would like to have their ISO 22301 Business Continuity Management System expertise certified would also gain from enrolling into the course. Participants get to enjoy a structured and thorough ISO 22301 business continuity management (BCM) system understanding to implement and maintain their BCM plans. The course takes its cue from the globally recognised 7 BCM Body of Knowledge or BCM BOK implementation methodology. Essential steps of developing business continuity and disaster recovery strategies would be shared. Design and implementation of BC plans would also be facilitated in a hands-on 1-day workshop. Tips and best practices on preparing and conducting awareness and training programmes are also part of the curriculum. Skillsets they would gain include project management, risk analysis and review, business impact analysis, recovery strategy, plan development, testing and exercising, and program management. On completion of the course, participants should have acquired the skills and understanding to be able to drive complex BCM programs and BC projects for the entire organisation. A 3 1/2 hour, 150 online MCQ exam would be administered at the end of the course to test their understanding of the concepts taught. The Business Continuity Certified Expert (BCCE) Certification would be awarded to participants who successfully completed and passed the Qualifying BCCE examination attached to the course, sends in an application detailing at least 3 year of BC experience , make the application processing fee payment of SGD150 and satisfies and meets the experience requirements of the independent certification body. Identify possible threats that may disrupt critical business functions in the organisation. Identify and analyse business requirements to recover critical business function. Develop business continuity and recovery strategies. Create and develop BCM awareness and training programme. BC Managers, Organization BCM Coordinators and Practitioners tasked to drive large and complex corporate level BCM programmes will reap maximum benefits from the concepts and practices. Experienced professionals with 3 years or more experience, from the security, risk management, facility, IT security, business operations who have direct or indirect responsibilities are encouraged to apply for their Business Continuity Certified Expert (BCCE) certification.